SAFE Alert! 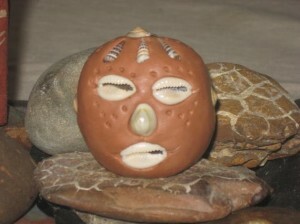 Palo Mayombe practices are being mixed with Santeria Lukumí practices. A common problem our SAFE members have been observing online and in botanicas around the country is a blending or superimposing of the religious practices of Santeria with those of a separate religion known as Palo Mayombe. Thus far we have seen examples of “Palo elekes” being given for the mpungos, “orisha signatures” culturally appropriated from Brazilian traditions, people being told to be initiated in Palo through diloggún divination, and people being told they need to receive “Palo warriors“. Additionally, there is a growing trend in the USA of people being told they must be initiated in Palo (scratch in Palo) before they go through the Kariocha initiation, whether or not divination is performed to validate that initiation is needed by that person. A prenda or nganga. The focus of Palo Mayombe’s magical work and worship. This is not Santería Lucumí! In order to understand the differences between Palo and Santeria it is important to understand the different points of origin for these two religions. Palo Mayombe is a religion that evolved in Cuba out of the native religious practices of the Bakongo speaking people of Africa. The Bankongo-speaking people (commonly called Congo) originated from modern-day Congo, Angola and further south on the West African coast. The Bakono-speaking tribes were some of the first slaves taken to the Americas in the slave trade and their religious practices were well-established in Cuba long before the Yoruba people arrived with their Lukumí religion. To contrast, Santeria Lucumí evolved in Cuba out of the traditional religious practices of the Lukumí/Yoruba people who were from the Yoruba-speaking lands of Africa (centered around modern-day Nigeria and Benin) – further north along the West African coast. In Africa, the Yoruba and Congo people were always warring with one another. They were mortal enemies and their religious systems were in direct opposition from one another. Palo Mayombe is also called by other names (depending on lineage) including: Palo Monte, Palo Kimbisa, Palo Briyumba, or La Regla del Congo. Palo’s religious function revolves around the prenda or nganga – a magical cauldron composed of different soils, stones, wooden sticks, tools and bones. The prenda is a microcosm of the world, and contains a powerful pact between a spirit of the dead and the mpungo (force of nature) who rules the prenda. The Palo priest – called a Palero or Palera – directs the spirit of the prenda to perform works of magic, to heal, curse, make magical changes happen or to make pacts with new initiates. Palo’s worship is very necromantic and heavily involved with working with spirits of the dead. Palo’s primary initiation is the Rayamiento (scratching) in which the body of a new initiate is ritually prepared by forming a pact with the nganga for protection and spiritual evolution. The Rayamiento derives its name from the ritual practice of lightly cutting the skin of the initiate. Such cuts are never performed in any Lukumí rituals. In modern-day Cuba and in the United States it has become more and more common for people to be initiated into both Palo and Lukumí. Lucumí and Palo often exist in parallel within the lives of many adherents to both faiths. Unfortunately, this has led to the modern innovation that a person MUST be Rayado (scratched or initiated in Palo) before undergoing Kariocha, or that once a person goes through a Rayamiento in Palo that they will naturally make their way to Kariocha in Santeria Lucumí. This is misinformed and is not traditional by any means – though it is a very common practice. To be perfectly clear, initiation in either religion can only be determined through their respective divination systems. It is not correct to assume that someone will be initiated in both or either religion. If a person’s destiny, as revealed through divination, is one where they will only participate in Palo, that is perfectly acceptable and traditional. Similarly if a person’s destiny, as revealed through divination, only requires them to be made a priest in Santería through the kariocha initiation, then that is perfectly acceptable and traditional. One does not automatically lead to the other. There is one thing to keep in mind, however. 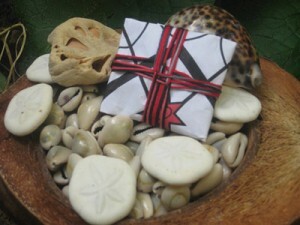 According to the Lucumí religious beliefs, kariocha seals the body’s energy systems and must be the last initiation ever conferred upon a person. To cut a person’s body open and make them open to ritual energies after they receive kariocha is very dangerous. Therefore, it is best to make sure any obligations or requirements in Palo are met and completed prior to going through the kariocha ritual – if it has been divined that it is part of your destiny. There are some religious lineages who do not think there is any risk in undergoing Palo rayamiento after kariocha, but we at the Santeria Church of the Orishas do not recommend that. If this is your desire then it is best for you to consult your elders and follow their advice, and at least bring your tutelary orisha’s diloggun down to the mat to receive their permission before undergoing any such initiation. This is the Collar de Bandera used by Palo initiates. It is worn diagonally across the chest and reaches from a person’s shoulder to their opposite hip. One of the fraudulent initiations that SAFE recently came across was the practice of giving out “Palo Elekes”. 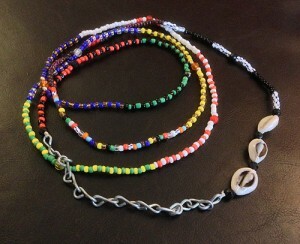 Elekes are beaded necklaces given in Santería, not Palo. The word eleke comes from the Yoruba word “bead”; note, YORUBA word, not Bakongo. 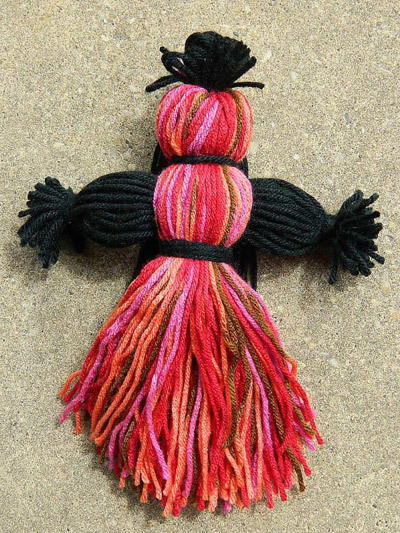 Elekes are one of the first initiations given to most adherents of Santeria and they are typically given as a set of 5 beaded necklaces (elekes for Eleggua, Obatala, Oshun, Yemaya and Chango) that are worn around the neck and hang down to a person’s mid-torso. A person can also receive a singular eleke if they need that orisha’s protection and cannot afford the complete elekes initiation. Such elekes are never given out in Palo Mayombe. 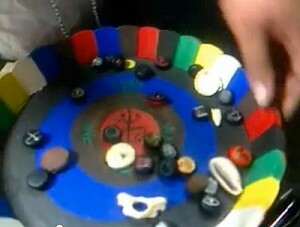 Palo Mayombe initiates who have been scratched in the Rayamiento ceremony do receive one necklace that is called a Collar de Bandera (banner necklace). This is worn diagonally like a sash across the person’s body from their shoulder on one side down to their hip on the other side. It is a mark of that person’s status as an initiate and confers upon them the protection of the nganga. These are usually beaded in one long strand of multi-colored beads, or with segments of different patterns for each of the nature forces in Palo (red/black for Lucero Mundo, green/black for Sarabanda, white for Tiembla Tierra, etc.) There are variations of this necklace depending on whether an initiate has received a nganga of his own and typically this includes a series of coins linked into the necklace or three cowrie shells on a segment of chain. This is a ponto riscado from the Brazilian tradition of Umbanda. 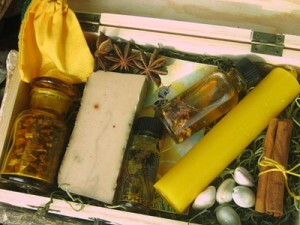 It is NOT anything used in Santería Lukumí! 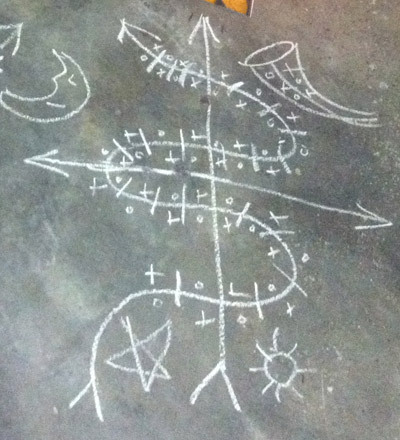 The members of SAFE recently heard of a “babalawo” teaching students that these were “orisha signatures” that were to be used in spell work as a way of calling the orisha. He also culturally appropriated the pontos riscados of Brazilian Umanda for the same purpose. 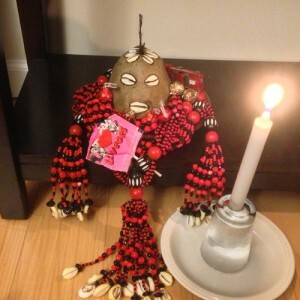 There is one prolific author who is well known for mixing up the practices of Brazilian Umbanda and Kimbanda into Santeria Lucumí and such practice would never be accepted by either Brazilian or Lucumí practitioners. Within Santeria/Lucumí we do not utilize such “orisha signatures”. The only type of drawn symbol used is the ozun (or Osun) which resembles a bullseye made up of concentric circles painted in the colors white, yellow, red and blue (in an appropriate combination for that orisha’s initiation). These are seldom done outside of an initiation, however. 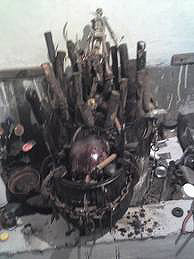 There is one instance where people use symbols that may resemble palo trazos, and those are specifically related to working with the orisha Osain in front of his cauldron. The instance we observed regarding “orisha signatures” was not this situation. It was clearly someone who was perpetuating illegitimate practice. This practice is very common to find amongst paleros and olorishas, yet it is not appropriate and not-traditional. Occasionally, paleros will indicate through a Palo divination that a person has to undergo kariocha to be an orisha priest. Similarly, some olorisha diviners will tell people that they have to receive a nganga in Palo. This cross-prescribing of ritual practices across religious lines is not acceptable and is completely inappropriate. 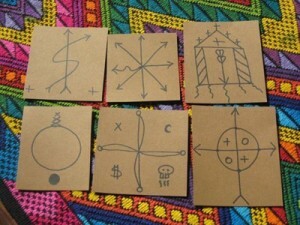 The divinatory tools of Lucumí (diloggún, obí, Ifá) should be the only ones used to determine the religious and initiatory needs of a Lucumí practitioner (not Palo divination nor Spiritist readings). Similarly, the divination tools of Palo (chamalongos, nkobos, vititi mensu) should be the only ones used to determine the religious and initiatory needs of a Palo practitioner (not Lucumí divination nor Spiritist readings). This is a very common occurrence that we at SAFE have witnessed in both the Santería/Lukumí community as well as in Palo and Espiritismo. The best recommendation we can give to avoid any complications or disrespect of priests, is to receive the information you are being told as a suggestion, then go get divination done in the appropriate religious tradition to confirm that suggestion. For example, if in a Lucumí diloggún reading you are told that you need to be rayado in Palo (initiated), do not accept this as fact – simply as a suggestion. Then follow up by going to a Palo priest and having him do the appropriate divination to ask whether you need to be rayado in Palo (initiated). If the Palo priest confirms it, then consider it as fact. Similarly, if you go to a Palo priest and he tells you that you have to go to an Olorisha and receive warriors (or undergo some initiation in Ocha), do not accept this as fact – only as a recommendation. Follow up by visiting an Olorisha and having them perform diloggún divination to find out if you do indeed need to receive warriors. If he confirms that you do need warriors then it is marked as fact. If he says no, then you are not required to receive them. This is the best way to make sure you work within the lines of each religion in a multi-cultural world, and respect their traditions without mixing them. Diviners within both traditions would do well to respect the authority and jurisdiction of their counterparts and simply refer the client to a priest of the other religion to let them find out what needs to be done.